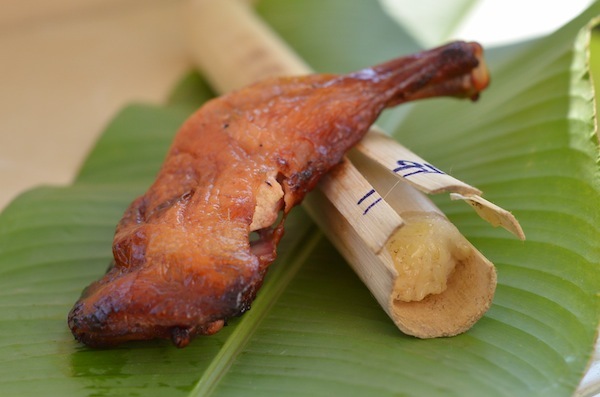 One of my favourite breakfast options in Chiang Mai is honey-roasted chicken and bamboo sticky rice. The sticky rice is cooked inside segments of bamboo and is slightly sweet. It comes plain, with poppy seeds and with beans. We couldn’t read the Thai writing on the bamboo so buying bamboo sticky rice was always a bit of a lucky dip for us. Looks tasty, but how do you get the rice out? Does the bamboo break open or do you use your chopsticks to excavate? Yes, you peel the bamboo like it’s a very tough banana. And, um, we used our fingers to get the rice out! The rice sticks together, so you can break off a piece quite easily. And you are right – it is very tasty. yum yum yum. i would LOVE to eat that rice!! That looks really tasty. It might take me a while to get used to the concept of eating chicken for breakfast, though.